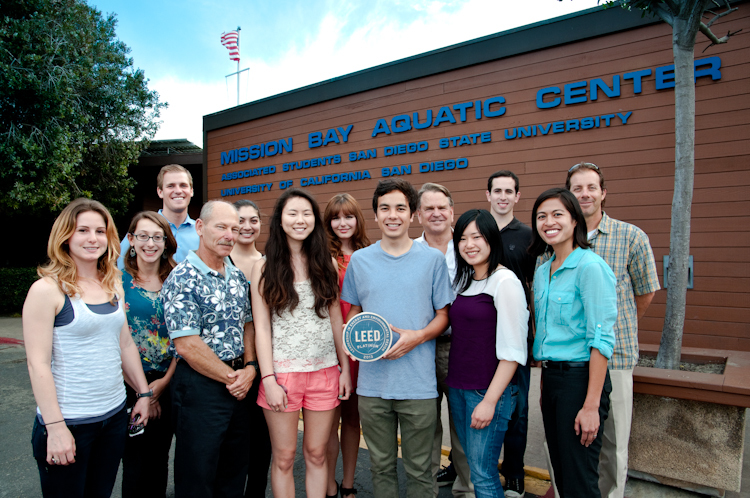 Mission Bay Aquatic Center Blog: MBAC RECEIVES CERTIFICATION OF LEED PLATINUM! In April, the Mission Bay Aquatic Center became the first in the California State University System and second facility in San Diego County to achieve Leadership in Energy and Environmental Design (LEED) Platinum certification for Existing Buildings Operations and Maintenance. LEED is an internationally recognized green building rating system, overseen by the United States Green Building Council (USGBC). Platinum certification is the highest level of recognition for green buildings under LEED guidelines. Getting certified by the USGBC is not an easy endeavor even for a facility that meets all of the requirements. It takes hundreds of man hours to provide documentation and compile data to earn credits to successfully complete the performance period. This work fell on the MBAC LEED Certification Team, a group of student volunteers from SDSU and UCSD who did the yeoman’s work over a period of 12 months. Many of the students are members of SDSU’s Green Love Committee or the USGBC Student Chapters at SDSU and UCSD. MBAC’s certification at the level of Platinum is an extraordinary accomplishment for a 40 year old building. Glen Brandenburg, Associated Students Director of Facilities and Sustainability, who was also the Director of MBAC during its construction in 1975, points out that many of the features that are included in modern green building design were implemented in the original MBAC construction, long before people were thinking about sustainability. "When we first built the MBAC we included a lot of design elements that were meant to have long-term impact on keeping operating costs down," says Glen. "And while our decision at the time was based on economics, the conservation aspects of the design features are being implemented today as having both an economic and ecologic benefit. It's a win-win for businesses."